A hometown hero and a legend on the sidelines, friends reminisced Tuesday on Ohio State football coach Urban Meyer. Classmates in Saybrook Township who played ball with Meyer decades ago say he’ll live on to be a legend. Rozzo went to grade school with Meyer and played ball with him. 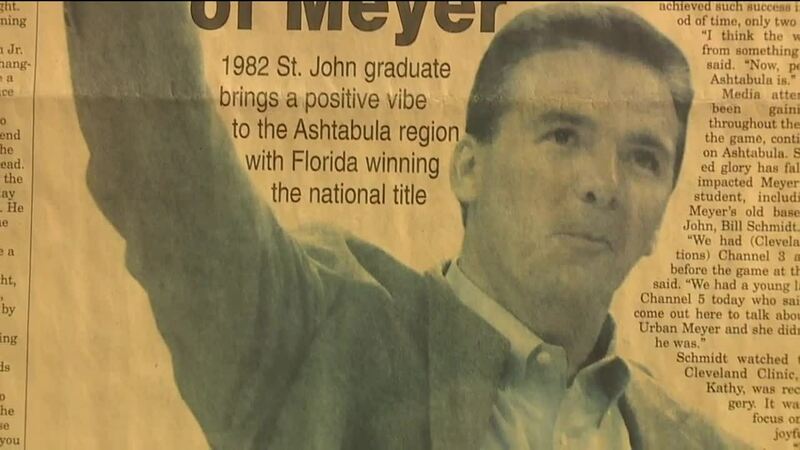 He said Meyer was always a natural leader — inspiring his teammates to win. Meyer guided Ohio State to the national championship in 2014 after doing it twice at Florida in 2006 and 2008. Sister Maureen Burke is the President at St. John School in Saybrook, where Meyer went to school. She showed News 5 pictures of him from a 1982 yearbook. “Baseball was this more successful sport at St. John rather than football, but obviously, he’s made football quite a career for him," Burke said. As he steps out of the limelight, folks in Ashtabula want Meyer to know he will always have a place to call home. “We are all proud of Urban and what he’s accomplished, in his career, as a coach, as a mentor, as a father to other people. I’m proud to know him as a friend too," Burke said.